RAILBLAZA’s two newest product releases make it easier than ever to keep important kayaking gear within reach on the water. Now available through the YakGear website and local YakGear dealers, the RAILBLAZA QUICKGRIP Paddle Clip and QUICKGRIP Hip Clip are must-have tools for any paddler. 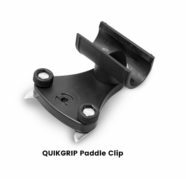 RAILBLAZA’s QUICKGRIP Paddle Clip attaches directly to your kayak — or to any track on a watercraft — allowing paddlers to safely and securely store their paddle, push pole or landing net. Its versatile design accepts the RAILBLAZA MiniPort Track Mount, making it possible to incorporate an additional RAILBLAZA accessory aboard the watercraft. Meanwhile, its durable construction of high-strength, nylon-injected AES means the product can stand up to even the roughest rides. It sells for $18.99. YakGear’s other big RAILBLAZA release, the QUICKGRIP Hip Clip, allows paddlers to attach a paddle, push pole or landing net to their belt to avoid uncomfortable bending and reaching. The product’s Clakit Clip locks it securely in place, while its plastic teeth grip the inside of the paddler’s belt to avoid slipping. Two sizes are available — the standard, which accommodates accessory shafts with a 1” to 1.2” diameter, and the large, which accommodates shafts with a diameter of 1.2” to 1.4.” The RAILBLAZA QUICKGRIP Hip Clip comes fully assembled and sells for $15.99. Between unpredictable conditions on the water and the pain and strain that come with reaching to retrieve tools, the new QUICKGRIP accessories make paddlers’ lives easier, YakGear President Bill Bragman said. 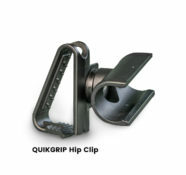 For more information about RAILBLAZA’s QUICKGRIP Hip Clip or QUICKGRIP Paddle Clip, visit their respective product pages.